So nice to see this beautiful card in our gallery this week! The moose die shape is perfect and I love all of his accessories! Thanks for playing Merry Monday this week! Super duper inked sky with the cute moose! what a great moose and your winter sky is gorgeous! Love that moose die!! And the background you made is beautiful! This is just the cutest moose die, Karren! I can see the pattern on him and I love his cap and lights! Gorgeous background too! So good to still be seeing you at Merry Monday! 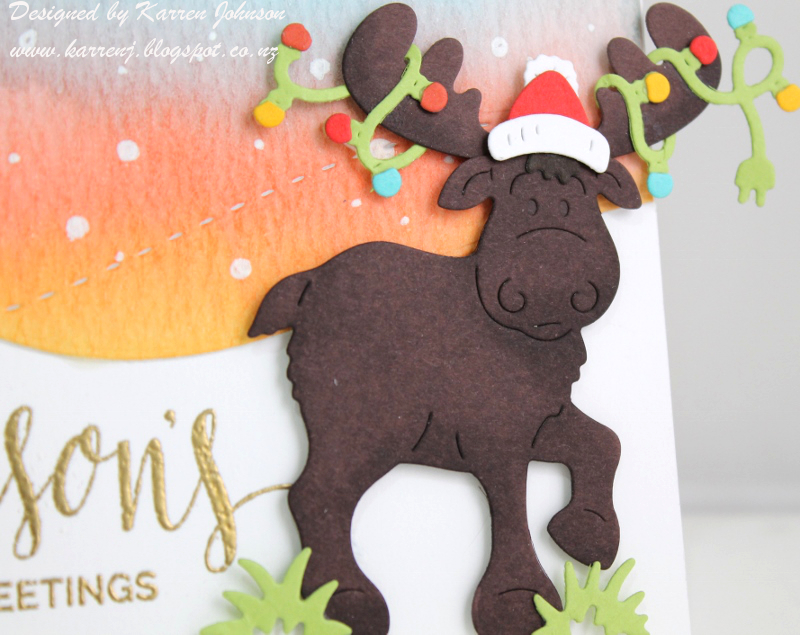 What an adorable card Karren, I love your super cute moose. So glad you joined us for MM this week. Hola Karren, thank you for your comment. Gorgeous card, your background is beautiful! great colouring, i love your moose, so funny! Fantastic card! Wow, that sky! Beautiful! And I love the details in the die cut with the lights! So glad you joined us at Muse this week! Your background is beautiful! Love the moose, too — great card! Phooey to the DP! Your sky is gorgeous... and that Moose? So happy to meet him in the gallery this week! that background is amazing. those lights are cracking me up! 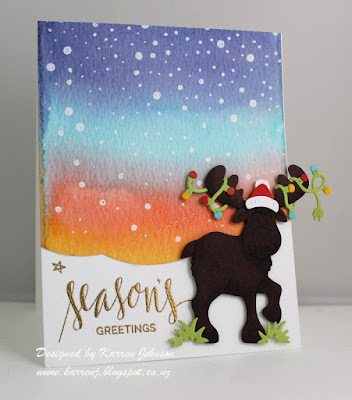 A cheerful moose and a fantastic BG... makes for a great design! This is fabulous! I don't even own anything moosey - you always have an image/stamp for every challenge! Love your blending in the background! The moose is so cute too. I wondered if I'd see a moose show up in your repertoire! And you did not disappoint! Your sponged background is like a northern lights display! What a wonderful card!